Students for Justice in Palestine at the University of Chicago (SJP) has filed a written complaint with the Office of Campus and Student Life, University administrators confirmed on Thursday. SJP asserts that its on-campus posters have been repeatedly written on, improperly removed, and criticized by unsigned flyers, all of which are violations of the University’s posting policy. In e-mail, Dean of Students Michele Rasmussen confirmed that the administration is investigating SJP’s complaint, and condemned the anonymous postings as contrary to University values. “The University is aware of the anonymous flyers that have been posted around the campus. The failure of the creator of these flyers to attribute them to an individual or group leaves little doubt as to their intent to deceive, and undermines the free and rigorous exchange of ideas. A complaint has been filed with Campus and Student Life…[and] Campus and Student Life has contacted the leaders of [SJP],” Rasmussen said. The Posting Policy which is available on the Center for Leadership and Involvement website, states that “individuals should only remove other’s postings if the date of the event has passed,” and that “posting should not cover current postings belonging to other organizations or individuals.” Anonymous postings are prohibited in University buildings, with the exception of the Reynolds Club. Third-year Cara Piraino, a member of SJP, said that the origins of the group’s complaint date back to the morning of October 14, when the group posted flyers across campus in conjunction with its “Day of Action,” which took place later that day. The posters stated the names of various individuals that had been, according to Piraino, “murdered by the Israeli military.” However, some of the Palestinians that SJP listed as dead are, in fact, still alive. 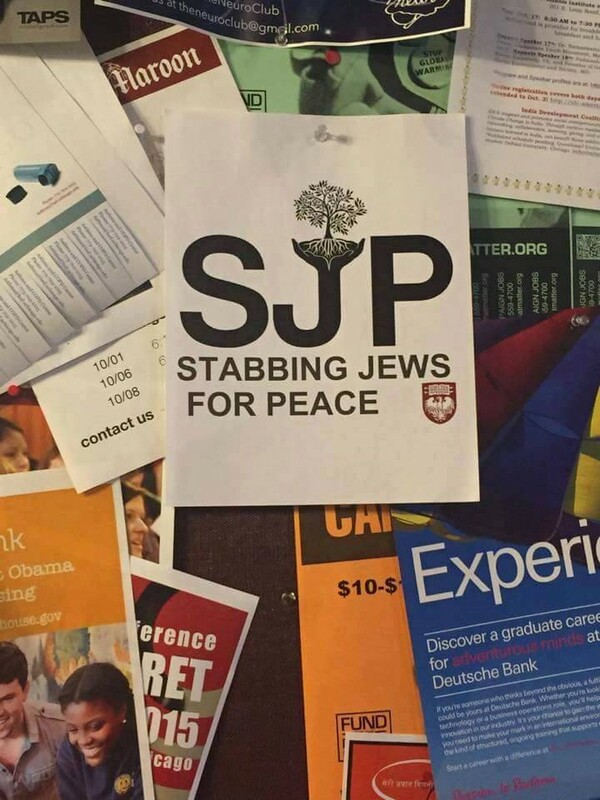 SJP has also sent photos to The Maroon that show various unsigned posters that criticize the group, which it said were posted recently. One batch of unsigned posters, which Piraino said appeared on the 15th, correctly disputed SJP’s posted claims that Esra’ Zidan Abed and Ahmad Manasra were dead. A second, which Piraino dates to October 19, was an apparent play on the “SJP” abbreviation that reads “Stabbing Jews for Peace.” However, Piraino and third-year Zach Taylor, another member of SJP, said that the unsigned flyers were posted outside of the Reynolds Club, which would contradict the Posting Policy, irrespective of their editorial content. Citing violations of the Posting Policy, Taylor said that SJP and one student not affiliated with the group filed their complaint at a Tuesday meeting with Jeremy Inabinet, associate dean of students in the University for disciplinary affairs. At the meeting, Inabinet verbally promised the group a meeting with Rasmussen. “First, we want an investigation into who is vandalizing SJP posters. Second, we want the administration to take the necessary steps to punish the people who vandalized our posters, and the people who distributed the anonymous posters. Third, we want the University to make a public statement against the harassment of SJP members. Fourth, we want a guarantee that SJP members will be [physically] safe, in accordance with the group’s rights as an RSO,” Taylor said. As of press time, Taylor said that Rasmussen had not responded to the meeting times that SJP suggested at the Tuesday meeting.